When the whole group joined together with our team head in the hotel restaurant yesterday evening, we talked and shared with each other the lovely things happened recently. He went to Avenue Q last month and had a great time there. Through his vivid description, we immediately got attracted to the musical opera and asked whether we can watch some video. He then suggested us to convert YouTube video to MP4 for better experience. The purposes for converting YouTube to MP4 are summarized as follows. Converting YouTube to MP4 ensures users to watch the video from time to time and playback anytime anywhere they want. Converting YouTube to MP4 enables users to watch the video without network access or when network is unstable. Many more portable devices or MacBook will be supported after converting YouTube to MP4. In the following parts, I am going to introduce you several ways to convert YouTube Video to MP4. To facilitate users to convert files between all popular formats like FLV, AVI, MP4, MOV, MP3, AAC, FLAC, etc. Leawo, an innovative and top-notch solution provider, develops this fast and easy video converter. This all-in-one software is an amazing converter which not only enables users to convert between tons of formats, but also offers powerful editing features to add special effects, watermarks, etc. You can get Leawo Video Converter from its official site. For converting YouTube video to MP4, you can follow the steps below. Step 1: Download and install a latest Leawo video converter to convert YouTube to MP4 by clicking the buttons below. Step 2: Drag the YouTube file or click Add Video to put the YouTube file to the Convert page. To convert multiple YouTube videos to MP4 at a time, click Add Video Folder to put files to convert. Please also note that Leawo Video Converter allows users to download YouTube videos from its Video Downloader on the home page. You can click it to download videos directly from YouTube before converting YouTube videos to MP4. Step 3: Click Change on the drop-down window on the left hand of Convert button to change YouTube videos to MP4 format. 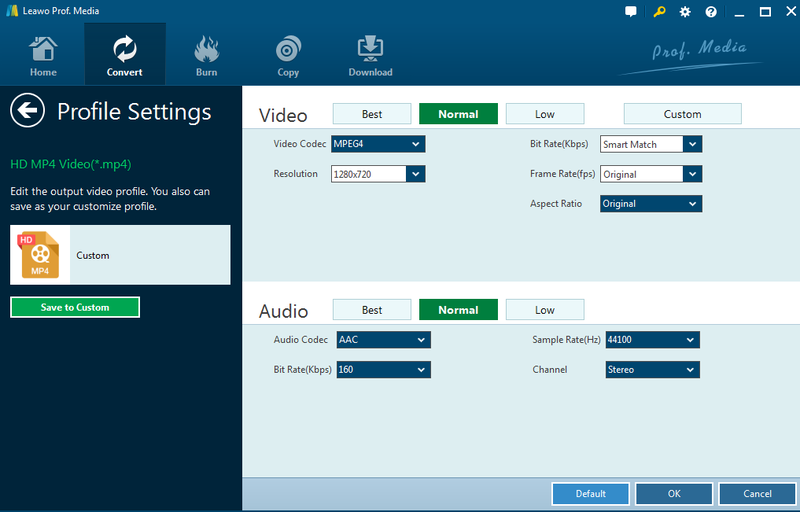 Step 4: Click Edit to customize the video by setting parameters such as video codec, resolution, bit rate, frame rate, etc. Step 5: Click the green button Convert to change YouTube video to MP4. Keep in mind that you can set the directory to save the converted YouTube file. YouTube accommodates rich videos to viewers ranging from education, entertainment, to politics. Due to limited supported formats like FLV and network accessibility, many viewers prefer to download and convert the YouTube video to MP4. Therefore there are numerous free and paid converters online. In the next part, I will show you another convenient converter to convert YouTube to MP4. Step 2: Paste the video URL on the blank before converting YouTube to MP4. Step 3: Select the target format from the dropdown list for converting YouTube to MP4. Please note that you can personalize the settings by clicking More Settings. Step 4: Click START to convert YouTube videos to MP4. Both Leawo and OnlineVideoConverter provide a competitive solution to convert YouTube videos to MP4. Based on personal experience, I made a brief comparison between these two converters in terms of changing YouTube videos to MP4. Speaking of video/audio quality, Leawo is much better in converting YouTube videos to MP4. It keeps an extremely fast speed to change a YouTube video to MP4, and it also allows users to convert YouTube videos to MP4 in batches. You don’t need to make any sacrifice on quality loss after converting YouTube videos to MP4. In addition, there will not be any privacy leakage when you use Leawo video converter to transfer YouTube videos to MP4. However, there will be some privacy leakage threatening if you choose to change a YouTube video to MP4 using an online converter. The last but not least, Leawo video converter enables users to personalize their videos when they convert YouTube videos to MP4, which is fast more convenient and user-friendly. When I convert a YouTube video to MP4 using Leawo video converter, it feels like I am a movie maker who is making films by myself and most important of all, I can enjoy videos all the time after converting YouTube videos to MP4.